Today’s POP RESCUE from an uncertain fate is the 1987 second album Whitney, by American singing sensation, Whitney Houston. From the opening bass drum and handclaps of hit single I Wanna Dance With Somebody (Who Loves Me), you know that this is going to be a great pop album. I remember this playing at my Aunt and Uncle’s wedding anniversary party – I wanted to dance too.. but just like the dilemma Whitney faces… I had no-one to dance with. This song is light, up-beat, and bounces along perfectly, aided by Randy Jackson on bass synth, and the infectious 80s pop sound. Whitney’s vocals really shine here – her vocals are refreshingly bright and make easy work of the range of the song. This is followed by Just The Lonely Talking Again, which is a luxurious ballad, in which Whitney easily switches over to breathy, delicate vocals. Randy returns with the bass here, and they are joined by Kenny G, who wields 80s Obligatory Saxophone. This is a wonderful soulful song, with brushed snare drums and some perfect backing vocals. Love Will Save The Day is up next, produced by Jellybean. This is a return to up-beat, but it’s not as light as the album opener. Still, this song gave Whitney her fifth hit single from this album. There’s some fantastic playing of the Vibes from Roy Ayers, which definitely deserves a mention! Whitney again has a fantastic range of vocals to perform here, and she carries them off perfectly, ending with a ‘that was so easy’ kind of cheeky chuckle at the end. Second single, which, to me, should have been Whitney’s Bond Theme – Didn’t We Almost Have It All, which has some similarities to Sheena Easton‘s For Your Eyes Only. This feels like an 80s power ballad: her vocals take centre stage, and she’s backed by a strings section. This reached #14 in the UK singles chart in 1987, but was rightly cut down for the single release – this album version goes on for about 40 seconds too long, although ends perfectly. 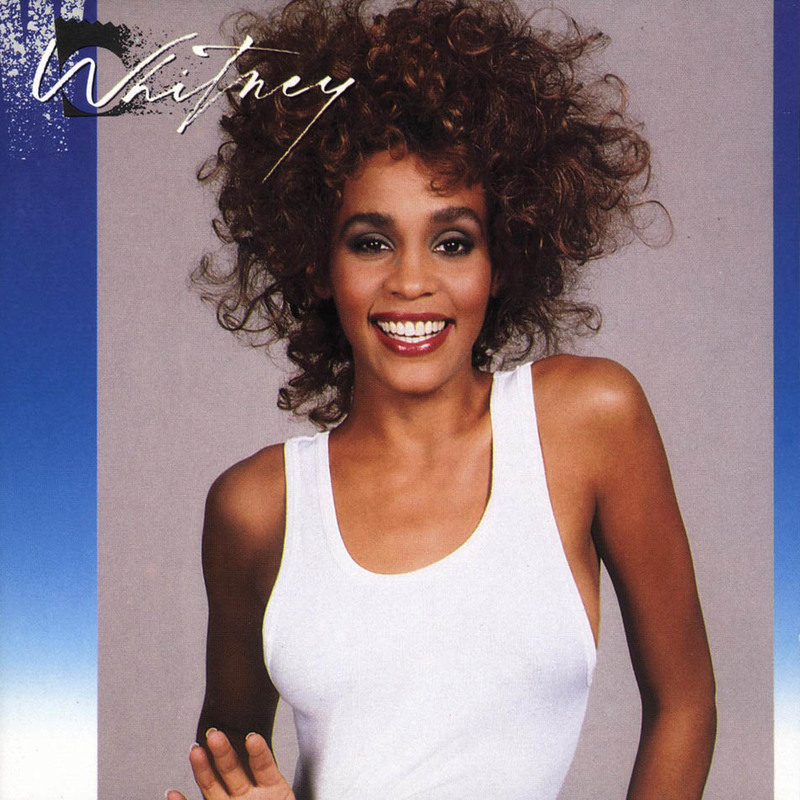 Up next is what I consider to be the best Whitney song of the 80s – third single So Emotional. It builds up perfectly, and this suits the more rocky sound – with Whitney pitched against a hard beat and growling guitars – there’s even a screeching guitar solo mid-way through – again with that chuckle thrown in (probably because the ‘guitar’ is actually just a synth, as the sleeve notes suggest). This is such a catchy song that challenges anyone not to sing along or at least tap their foot along to. We’re back into ballad territory now for sixth track, Where You Are, which is, if anything, the weakest song here – even if Whitney’s vocals are absolutely flawless. It has all the signature sounds musically, but the lyrics are quite forgettable – ‘today I did some shopping, just had to clear my mind again’ she sings. Thankfully at about 2m 15s the pace picks up, vocally and musically just to make it a bit more interesting for about 30 seconds before 80s Obligatory Saxophone pops in for a solo. Vinyl and cassette versions of this album would no doubt have ended here, and that probably felt better than it does here on CD. And keeping with that idea, next song Love Is A Contact Sport would have been the bouncy side two opening track, and it does that perfectly. This is a fun pop track, but thankfully one that didn’t become a single. This song could really have been sung by any female 80s pop star, as Whitney’s vocal ability feels a little shoehorned into this song with little space to flex. You’re Still My Man follows this and Whitney is back with a string section behind her. Her vocals here are strong and punchy, giving little time for those delicate vocals that she’s shown elsewhere. There’s plenty of space for her to hold those high notes, and at times it reminds me of some of the later songs from Dina Carroll. This is a song to sway to, and has probably played at many weddings. A cover of The Isley Brothers‘ hit For The Love Of You is up next, and is a gentle, soft wafting through their 1975 hit. This is a pretty loyal cover, treading very little fresh ground apart from the occasional flexing of Whitney’s vocal power. There’s some lovely warm backing vocals here. Kenny G and Randy Jackson return again here. Penultimate track Where Do Broken Hearts Go was the fourth single from the album, and this is a classic big 80s power ballad hit from the summer of 1988. The perfect ending to a school disco. Amongst the backing singers here is Niki Harris, who would go on to front dance/rap act Snap! and record and perform regularly with Madonna from 1987 onwards. The album closes with a cover of the huge 1984 Barbara Dickson and Elaine Paige hit (yes, here’s that video!) – I Know Him So Well – from the musical Chess. Here, Whitney sings the song with her mother, gospel singer Cissy Houston, whose deeper, somewhat more soulful vocals, act as the perfect contrast to Whitney’s lighter, higher-pitched vocals. This was the sixth single to be released from the album, although it only saw release in Australia, Germany, Spain and the Netherlands. Over all, this is a classic 80s album, and one that quite rightly gave Whitney the huge international stardom and exposure that she deserved. There were around 18 months between first and last single on this album – and it quite rightly gaining a slew of accolades including Soul Train award, and many RIAA awards. Sadly, she didn’t bag any BRIT Awards for this. She was robbed. Sadly, Whitney was found dead in February 2011, in her hotel room in Beverly Hills, California. She had drowned in her bathtub. Heart disease and her troubling addiction of drugs contributed to her death. She was 48 years old. Posted in 1980s, Whitney HoustonTagged 1987, Cissy Houston, Didn't We Almost Have It All, I Know Him So Well, I Wanna Dance With Somebody, Jellybean, Kenny G, Love Will Save The Day, Nikki Harris, Randy Jackson, Roy Ayers, So Emotional, Where Do Broken Hearts Go, Whitney, Whitney HoustonBookmark the permalink.